I was lucky to grab some of the Maybelline Bleached Neons polishes during a recent sale at Rite Aid. All Maybelline cosmetics were something like $2 off with your Rite Aid card, so it made these nice and cheap! Maybelline Citrus Collide is a nice baby chicken yellow creme. I do love me some baby chicken yellow! Citrus Collide is not quite pastel and not bright either, it's a nice in between. You can tell in the pictures that it has a bit of brightness to it, but it's more subdued and creamy. This is three coats of Citrus Collide. For a yellow this shade, it applied pretty well. It's actually not that streaky, maybe a little on the first coat, but the second coat really evened it out. It's pretty pigmented too, so if you do thicker coats than I do, two might suffice. Baby chicken yellows are notoriously hard to apply, so this was a pretty nice surprise. The Maybelline Bleached Neons are limited edition and still around in drugstores, although some shades are selling out. I still haven't been able to find Bleached in Peach, the one I wanted most! Boo! Happy Father's Day to all of your dads and/or husbands! Any fun Father's Day plans? 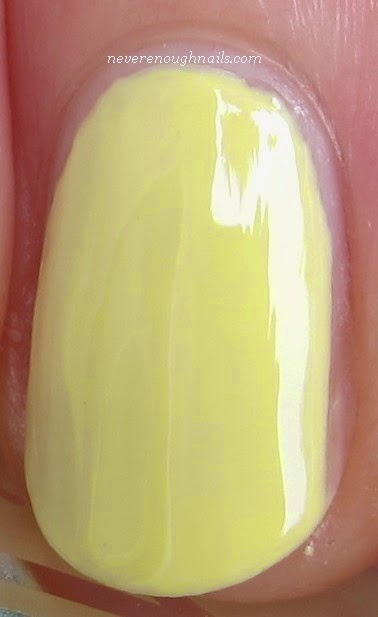 This is a very pretty and cute yellow! Glad to hear it was okay to work with :-) I've not seen this line from Maybelline over here yet! They went pretty fast around here Ananka. I hope you get them over there, it's a nice collection!